Надявам се, че и на вас ви харесва! The East Wind - Baby, it's cold outside! И не забравяйте, че имате още няколко дена да се включите в моята почерпка ТУК. Marie 18 ноември 2014 г., 15:03 ч. A really lovely card. I love all the fantastic embellishments you have use for this one. This is a great card that will make someone really happy. Thanks for joining us over at the Paper Shelter this week. Beverly Bohannon 18 ноември 2014 г., 16:37 ч. A beautiful card! 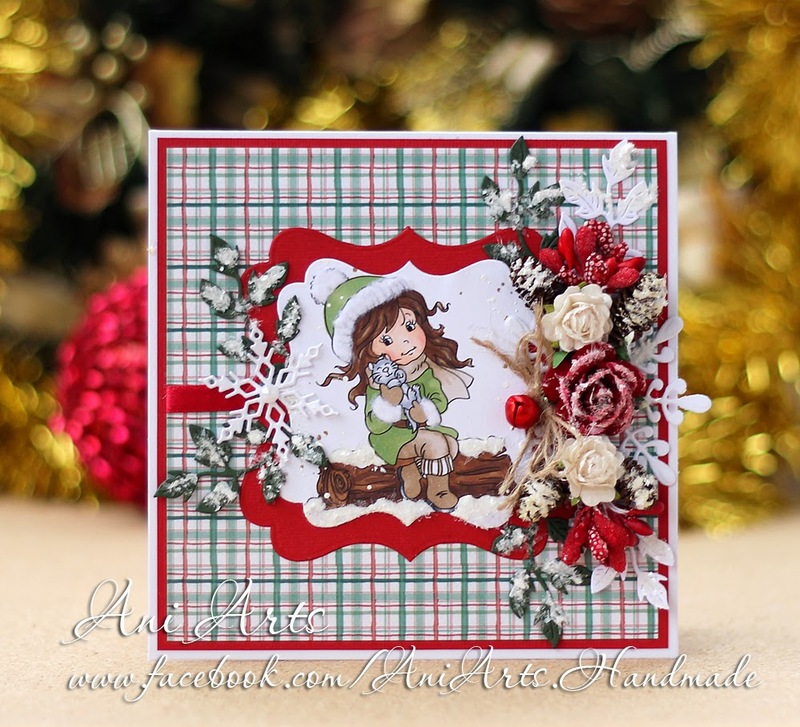 Thanks for playing in our Christmas Blooms challenge at classycardsnsuch.com! Helen 18 ноември 2014 г., 22:04 ч. Beautiful - a really sweet card. Mulberry Mindy 18 ноември 2014 г., 22:56 ч. Very lovely card! Thank you so much for joining our challenge, Christmas Blooms, at Classy Cards n' Such. Sandra H 18 ноември 2014 г., 23:01 ч.
Oh l love your image and as always your colouring is stunning and great backing papers too! Samantha Ball - aka (Craftychick74) 19 ноември 2014 г., 0:00 ч. Cure card and I love the choice of image. Donna Maligno 19 ноември 2014 г., 0:16 ч. This is simply adorable and so cheerful - love the addition of all the flowers. Thanks so much for sharing your art work on the Craft-Dee BowZ November challenge. Be sure and visit our blog for our Diemond Dies giveaway this month -- one more week! Diane 19 ноември 2014 г., 13:12 ч.
Gorgeous card with beautiful details and design!!! Thank you for joining us at "Classy Cards 'n Such" for our "Christmas Blooms" challenge!! Shirley-Anne Barber 19 ноември 2014 г., 14:58 ч.
Barbara Bruder 19 ноември 2014 г., 20:07 ч. Exclusively by Mel 19 ноември 2014 г., 20:12 ч.
Graciellie Ch 19 ноември 2014 г., 21:56 ч.
OH MY GOODNESS!!! This is such a lovely, delicate, elegant and super well done card. I am so glad you joined us this week at Classy Cards 'n Such! I am also subscribing to your blog so I don't miss any of your gorgeous creations! Danie May 20 ноември 2014 г., 0:45 ч.
Cazro 20 ноември 2014 г., 3:36 ч.
Anne Temple 20 ноември 2014 г., 17:58 ч. Another amazing project. Lots of great details too. Thanks for sharing it with us for the Sparkle N Sprinkle Creative Challenge. Shona Erlenborn 20 ноември 2014 г., 22:55 ч.
Gorgeous creation. Love the wintery feel to this card. Glad you joined as over at the Sparkle N Sprinkle Creative Challenge. Irene Watson 20 ноември 2014 г., 23:39 ч.
DonnaMundinger 21 ноември 2014 г., 17:45 ч.
Vicky F. AKA Crafting Vicky 21 ноември 2014 г., 18:39 ч.
ohhhh so pretty! Love all the great flowers you have added to this. wannabcre8tive 22 ноември 2014 г., 14:30 ч.
Ani, your card is so cute and pretty. I love the beautiful spray of flowers that you added. Thank you for joining us for the Classy Cards N Such challenge. Toni 23 ноември 2014 г., 9:08 ч.
Hi Ani... what a beautiful card !!!! Your coloring is gorgeous and I love your precious stamped image. The flowers complete your card perfectly ! Thank you for creating with us at Unruly ! Claire Dale 24 ноември 2014 г., 18:50 ч. Sweet card, love the flowers! Thank you for joining us at Dream Valley for our latest challenge! Bridget Curnow 26 ноември 2014 г., 21:02 ч. Guild Master Crystal 30 ноември 2014 г., 21:49 ч.
Gorgeous card. Those embellishments are so pretty. Sandra Mathis 21 декември 2014 г., 21:11 ч. Very cute card; this image is adorable, and you did a great job with the flower display. Thanks for sharing your favourite Christmas colour combo with us at LLC and Happy Holidays!